Swami Kriyananda has been a direct disciple for over sixty years of the great yoga master, Paramhansa yogananda. In this book, he introduces a new approach to the quest for God-realization that speaks to modern seekers. Demystifying the mystical, Kriyananda presents practical techniques, attitudes, and life directions that lead to inner freedom and joy. Whatever your level of spiritual interest or commitment, you will find A Renunciate Order for the New Age a must-read to give you an understanding of where religion is headed in the future. 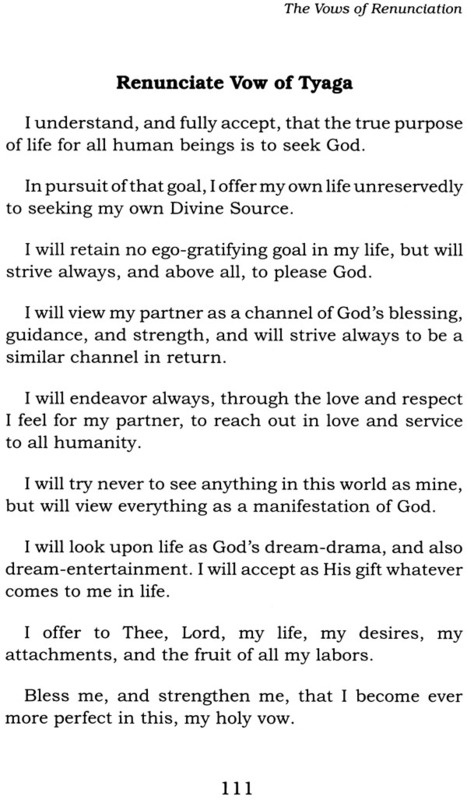 It launches a new era for people everywhere who want to declare their devotion to high, spiritual ideals. Swami Kriyananda, a direct disciple of Paramhansa Yogananda, is widely considered one of the world's foremost experts on spiritual practice, meditation, and yoga. He has written over 100 books- including interpretations of the Bible and Bhagavad Gita-which have been translated into more than 30 languages. In 1968 he founded Ananda Village, which over the past 40 years has become one of the most successful intentional spiritual communities in existence. Today, Ananda includes retreats and teaching centers, eight cooperative spiritual communities, and over 100 meditation group worldwide. Renunciation has ceased to command the respect it once had. Spirituality is on the rise, but many convents and monasteries stand empty. What people want now is a path where Spirit and Nature work in harmony, not in opposition to one another. Timeless principles, however, are not created by popular vote. Truth simply Is. Renunciation remains the heart and soul of the spiritual life. The problem is not with the principle itself, but the way it has been misunderstood and wrongly practiced. 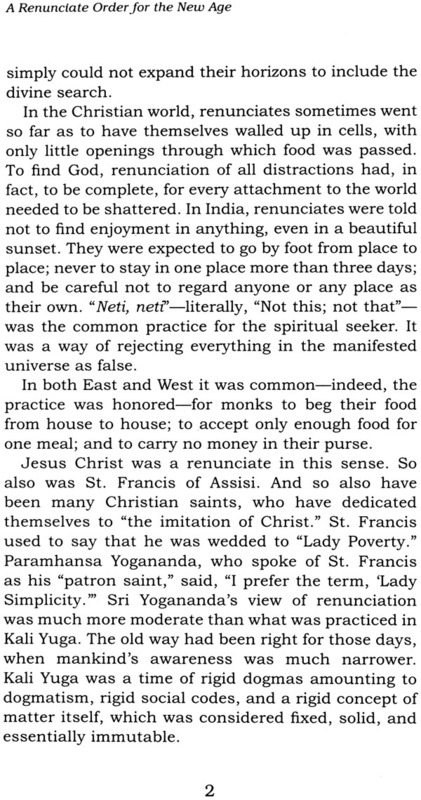 Renunciation has become defined by what you give up, or, even worse, by what God takes away. True renunciation is not a loss, it is an expansion to Infinity. 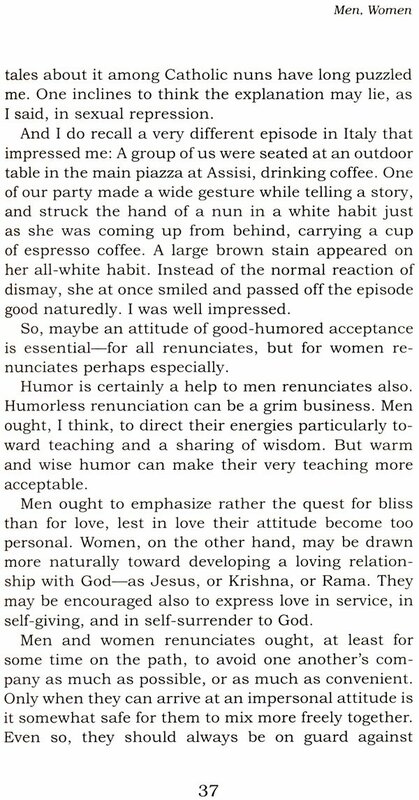 Joy and renunciation are two sides of the same coin. To suppress the ego is not the same as transcending it.
. The origin of this book is auspicious. A miracle healing was needed before it could be written. There has always been something mysterious about Swami Kriyananda's health. His body seems to be a battleground where the forces of Light and Dark meet. The battle is not about him personally, but for the work his guru, Paramhansa Yogananda, has commissioned him to do. The only way to describe it is "Satan tries to stop him." Often his most creative periods are paired with enormous physical challenges. Still, the effort has taken its toll. No physical body lasts forever. It is of no consequence to Swamiji whether he lives or dies; long ago he surrendered his life to his guru. Especially since he moved to India in 2003, Swamiji has had one health crisis after another. Often he has told his Indian audiences, "I'm not going to live much longer," hoping to inspire them to act quickly to build the work while he was still there to help them. Certain "readings," including the ancient Book of Bhrigu, implied that his eighty-third birthday, May 19, 2009, might be his last. Two days after that birthday, he was scheduled to fly from India to Europe. That morning he had some symptoms of a stroke: difficulty breathing, speaking, and so weak he had to be fed like a baby. Ordinarily, no one would travel in such a condition. 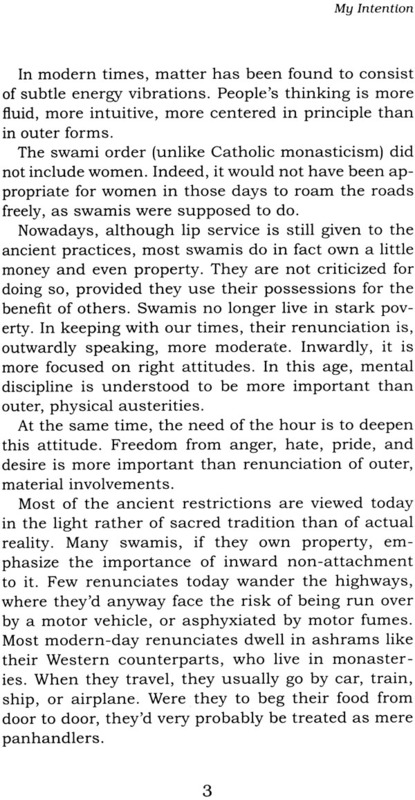 But persevering against obstacles has always strengthened Swamiji rather than weakened him. Once a project or transition is completed, usually health returns. But this time it didn't happen. Even weeks later, at home now in Ananda Assisi, the crisis continued. Rarely had he been so weak for so long. Someone had to be with him twenty-four hours a day. It was June 6; I was on the afternoon shift. A few friends were coming over in the late afternoon, so when Swamiji went to take a nap, he asked me to wake him in time for their coming. At 3:00 he was still sound asleep. Reluctantly I woke him and helped him sit up on the side of the bed. Traditionally, swamis wear orange, but I chose for him a blue shirt instead, thinking the color would lift his spirits. As I was doing up the buttons I said casually, "This blue is so exquisite. You should change the swami color from orange to blue.."
With great seriousness, he replied, "I am thinking of doing that." I helped him into the living room, then went back to get something from the closet. When I returned a moment later, he was stretched out on the couch, hands folded across his heart, looking up at the ceiling. I thought he might be dead. In fact, that may be when the miracle happened. To my great relief, he began to speak, introducing the ideas that are now this book: A Renunciate Order for the New Age. After a few moments, he paused, then quietly, with great force, declared, "This is what Satan was trying to stop." From that moment he began to get well. In the evening he called a group together to talk about the new order. Already he had written most of the first chapter of this book. Just hours before he couldn't button his own shirt. 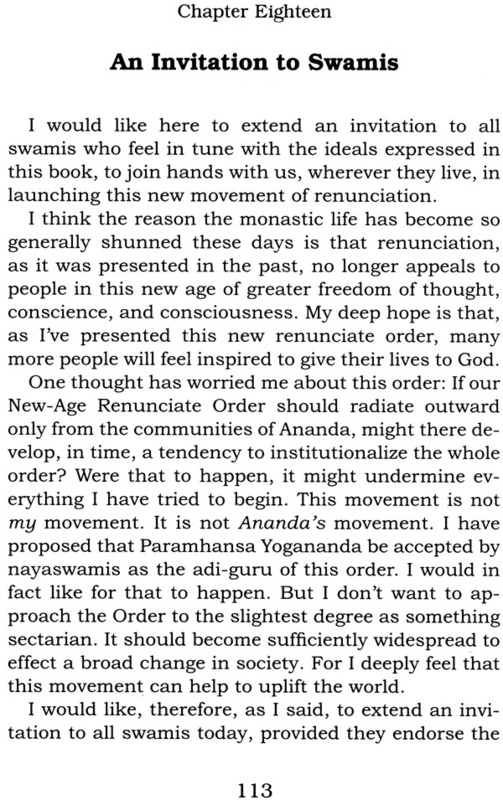 Now he was launching a revolution in renunciation for the New Age. "I entered a state of intense bliss," Swamiji said later, about this sudden change. 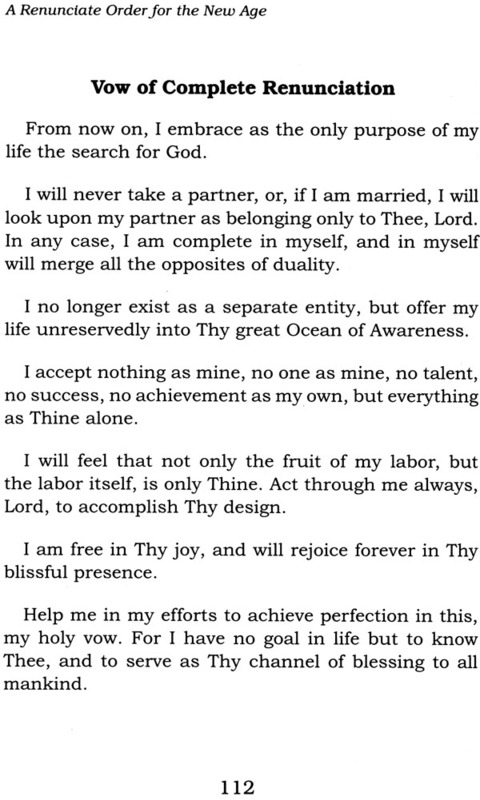 "I told Divine Mother, 'I'm ready to go and I am happy to stay, if You have more work for me to do here.' It didn't matter at all to me. When I came out of that state, I began to get well." When he left Italy a few weeks later, he didn't even bring his cane. 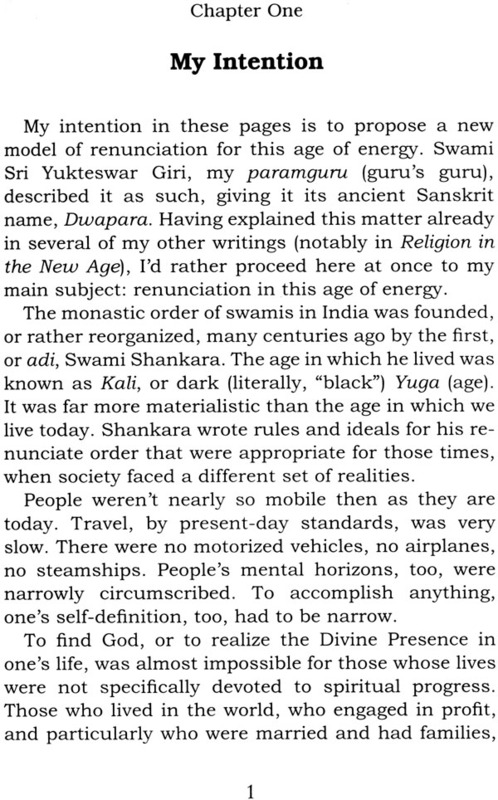 "I feel ageless," Swamiji says. "I don't identify with myself in any way now. It seems God has extended my life in order to do this work. It was a miracle healing." In the forty years that I have known Swamiji, his prodigious creativity has been nothing less than awe- inspiring. Books, music, communities, schools, retreats-a spiritual network that spans the globe. Often in my enthusiasm for some particular expression I have been tempted to declare: "This is it! This is his spiritual legacy." Of course, to say that is like defining the ocean by what you can see from the beach. 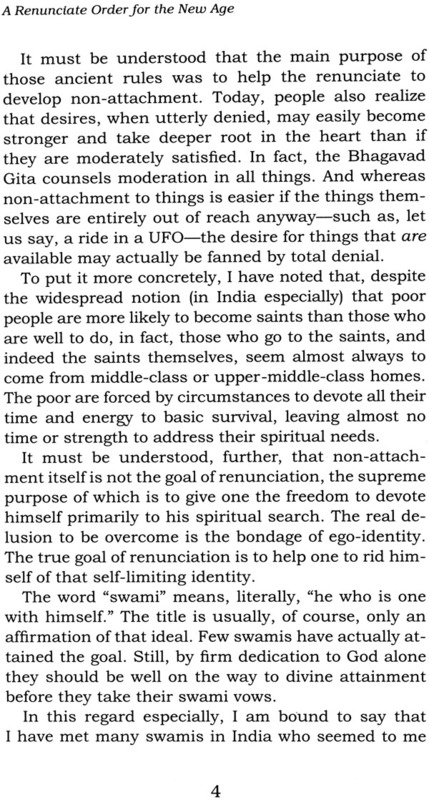 Still, folly though it may be, I dare to say that, in its cumulative effect, A Renunciate Order for the New Age may be one of Swamiji's most important contributions to the bringing in of a New Age. For it gives to truth seekers everywhere the courage, the clarity, and the way to open their hearts to God.